CRANBURY, N.J. — April 5, 2019 — At the 2019 NAB Show, IHSE USA will sponsor the inaugural NAB Esports Experience – a premium entertainment environment filled with high-end gaming PCs and consoles and featuring the most popular esports titles in the industry. In addition to getting in on the exciting gaming action, NAB attendees will be able to learn more about KVM’s role in esports. 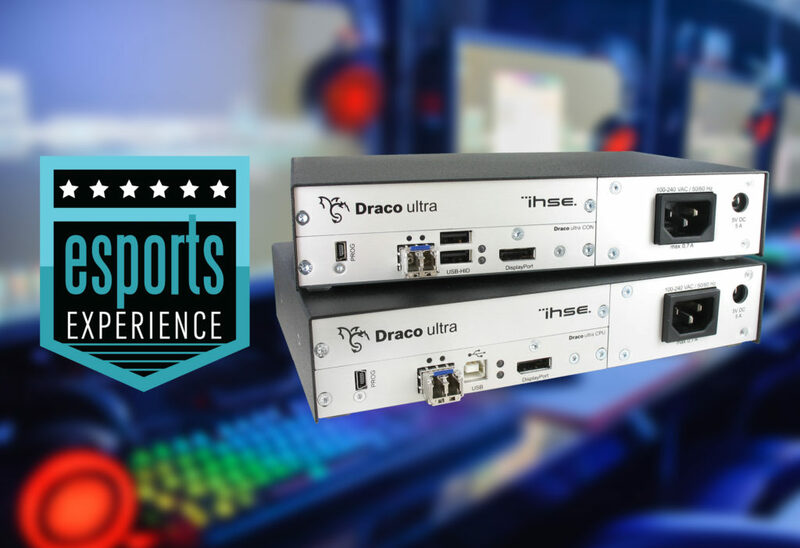 Industry leaders will present success stories of how designers, gaming developers, and live-event planners are achieving amazing results with IHSE’s esports solutions — including the company’s new Draco ultra DP 240 gaming extender. IHSE USA is also hosting a panel forum, “Before the Games Begin: A Behind-the-Screens Look at Building Amazing Esports Infrastructure,” at 1 p.m. on Tuesday, April 9 in Booth N1522. The audience will gain insights about how broadcast technology can be used for esporting events, and they will also hear firsthand why broadcast equipment manufacturers are increasing their involvement in esports engagement. The session will include discussions of cutting-edge installations as well as control-room and in-venue production designs that move esports operations to advanced levels. Industry leaders from top gaming companies will present success stories of how designers, gaming developers, and live event planners achieve amazing results for the latest esports fan experiences. Esports is the perfect application for a custom-designed, dependable KVM extender. Gaming pros typically require a lot of screens, both onstage and elsewhere, in a venue that can offer sufficient support for high-end, distributed video and direct computer access, together with minimal latency or mouse lag. Also, the backstage areas tend to be larger because the players and teams need to practice in those spaces. With Draco ultra DP 240, gamers have a single point of control for accessing and managing all of these sources from any location in a gaming venue. They’re able to see sharp visuals during fast-action game play with smoother mouse action compared to a typical 60Hz display.